This isn’t just another article about vSphere 5. It’s not my aim simply to rattle off a list of new and improved features. There are probably a plethora of those posts out there already, some better than others – use Google to find them. I was inspired to write this after I saw white paper linked to on Twitter about the differences between ESX and ESXi written by Global Knowledge. Actually it was the responses to that article that prompted me. Of all of the many changes announced today, it is the departure of the Service Console that is perhaps the most significant in my view. It may not be a new, super-whizzy feature and many people are already using ESXi and might be thinking “so what”. For me, removing the COS / SC / Service Console is significant for two reasons. Firstly, no longer can the unenlightened refer to vSphere as “Linux based” or “Unix based”. ESX never really was that and it wound me up more than it should have done when people got it wrong. I have a strong Microsoft background (although I can hold my own when it comes to Unix / Linux OSs) but in some companies that seemed to exclude me from touching VMware infrastructure even though I knew all about it. Ok, that’s more of a pet peeve than a significant reason. My other one though is that to me this signifies the direction in which VMware are taking virtualisation. It may even be more accurate to say that dropping the Service Console marks the completion of a transition or a journey. ESX was an excellent way for enterprises to make efficient use of powerful hardware amongst many other benefits but there was always a glass ceiling there. Some say that ESXi isn’t as flexible because it doesn’t have a command line. Perhaps they don’t realise that it really doesn’t need one. Occasionally, when things go wrong, SSH access is useful and ESXi does provide that. But for day to day usage there are better and more efficient ways to manage a Virtual Infrastructure (PowerCLI, vCenter or one of the many VMware and 3rd party products) and dropping the Service Console is both recognition and reinforcement of that. ESXi turns the hypervisor into commodity or utility platform, it’s not a management interface in its own right. ESXi is a foundation stone for building a dynamic, automated infrastructure so forget about the Service Console now. In some ways I’ll be sorry to see it go but ESX was a means to an end and it has reached its end. If, like me, you make your ESX / ESXi server passwords nice and complex you end up having to dig them out of a password safe every time you want to connect directly to one of them. Or you have an SSH connection manager of some sort perhaps. Even then, there will come a time when you want to connect directly and that 16 character, random, mixed case password just isn’t memorable enough for you to use it. Luckily if you’re running vSphere 4.1 or later you can configure your hosts to use AD authentication. Hooray! Obviously there are security implications to doing this. Each environment is different and any risks should be considered before implementing this. Time synchronisation – Your ESX / ESXi hosts must be synchronised to a time source and they should be in sync with the domain controllers in your AD domain. The authentication mechanisms in AD are very sensitive to time differences. Actually, that’s a delicate way to put it. It won’t work if the time is wrong. Name resolution – The ESX / ESXi hosts will use DNS to locate domain controllers for whichever domain you configure them to use. Therefore each host must have a working DNS configuration. An AD group – Sadly there is a limitation here. AD users that you wish to grant administrative access of your hosts to have to be a specific group in AD called “ESX Admins”. This is not obvious in the documentation however. The same document then talks you through configuring each host. It’s fairly simple. Click on the properties link to edit the “Authentication Services Settings”. In the windows that opens, select “Active Directory” as the service type. Then enter the FQDN of your AD domain into the domain field and click the “Join Domain” button. Finally you just need to enter the credentials of an account permitted to join the ESX host to the AD domain. Once the task in vCenter completes (it can take a little while), just refresh the “Authentication Services” page and you’ll be able to see that the host is now joined to the AD domain. All good unless you have a lot of hosts to work through. In which case, you might want to check out LucD’s very handy PowerCLI script to join hosts to an AD domain. I’m sure that someone somewhere has written a script exactly like this in the past but I wanted to write my own for a number of reasons. While I’ll probably never be a PowerCLI hero, it really doesn’t hurt to keep in practice and hone your skills. Before I get started, I just want to say that I don’t know for sure if this is an issue that is causing problems for some VMs that I have been looking at or not. I’d welcome any feedback, comment or help anyone has to offer on the topic. I thought that I’d share this just in case it helps anyone at any point. The environment that I’ve been working in is a shared web hosting platform built on ESX 3.5 and vCenter 2.5. Recently the focus of effort has been on data centre migrations, service migrations and office moves. Business as usual (BAU) activities have taken a back seat because of resource constraints. That includes upgrading the virtual infrastructure to the latest version. Currently vCenter is at Update 4 (build 147633) and needs to be brought up to date following the release of Update 5 a few weeks ago. The ESX hosts are slightly further downlevel however. Two thirds of them are on Update 3 (build 123630) with a couple of extra patches applied to bring them up to build 143128. The other third is on Update 2 (build 110268). Windows Server 2008 R2 has recently started to be used for some of the VMs and this is not officially supported until Update 5. Some of these VMs have had minor issues, things like random slowness and occasional failures to remove snapshots following their scheduled backups. While looking into these issues I discovered quite a variety of VMTools versions being used. Ideally all ESX hosts in a cluster should be on the same update level. The version of VMTools that a VM uses should ideally match the lowest build version of ESX that is being used in a cluster as the VM could potentially run on any host in the cluster. 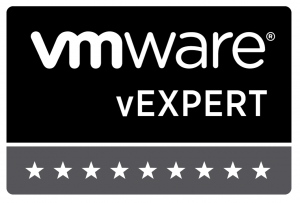 On one VM vCenter said that the VMTools version was “OK” but I wanted to run a manual “Install / Upgrade” on the VMTools anyway just to run a repair and make sure that the drivers were installed correctly. When I tried to do this, the installer popped back an error stating that a newer version was already installed. $myCol | Export-Csv -NoTypeInformation "C:VMToolsVersions.csv"
This shows the different combinations of ESX hosts versions and VMTools versions being used. What’s very interesting are the VMs running VMTools version 164009. That is the build number for vSphere 4.0.0! I know how this has come about. Rather than using templates, the preference here is to use a Windows ISO file that has been customised to be a practically unattended install that also includes a number of automatically installed applications. One of these is the VMTools installation. As there is a vSphere infrastructure here also the ISO has been modified to include the latest tools version so that one ISO fits all. But does it? The VMs are running butis the version of VMTools causing problems? That’s the bit that I don’t know the answer to yet. If anyone does know, please feel free to comment. For now the way forward is going to be creating multiple ISO files or removing the VMTools installation from the ISO altogether. That way new builds will get their VMTools installed from the ESX server that they’re running on. An upgrade to Update 5 is also called for and with next week looking to be a bit quieter I think that it’ll be planned then to be executed early in the new year. I mentioned ESX 3.5 Update 5 only yesterday in my post about VMtools on Windows 2008 R2. Little did I know that 16 hours later I’d be writing about it again to say that it had been released! Enablement of Intel Xeon Processor 3400 Series – Support for the Intel Xeon processor 3400 series has been added. Support includes Enhanced VMotion capabilities. For additional information on previous processor families supported by Enhanced VMotion, see Enhanced VMotion Compatibility (EVC) processor support (KB 1003212). Driver Update for Broadcom bnx2 Network Controller – The driver for bnx2 controllers has been upgraded to version 1.6.9. This driver supports bootcode upgrade on bnx2 chipsets and requires bmapilnx and lnxfwnx2 tools upgrade from Broadcom. This driver also adds support for Network Controller – Sideband Interface (NC-SI) for SOL (serial over LAN) applicable to Broadcom NetXtreme 5709 and 5716 chipsets. Driver Update for LSI SCSI and SAS Controllers – The driver for LSI SCSI and SAS controllers is updated to version 2.06.74. This version of the driver is required to provide a better support for shared SAS environments. For more complete information about supported guests included in this release, see the VMware Compatibility Guide: http://www.vmware.com/resources/compatibility/search.php?deviceCategory=software. Support for High Consolidation in VMware HA Clusters – VirtualCenter 2.5 Update 5 includes significant performance and scalability improvements to VMware HA. Use VirtualCenter 2.5 Update 5 for environments with more than 35 virtual machines per host in an HA cluster. For information on the ESX Server host settings required for this scalability improvement, see ESX Server host settings required for environments with up to 80 virtual machines per host in an HA Cluster (KB 1012002). I think that there is a good chance that Update 5 may be the last major update that the 3.5 line of products receives. Or at least it will be for some time. I’ll have some upgrades to do as a result of this release but I’m pushing for upgrades to vSphere like crazy. You know it makes sense. Have you ever wondered how to install VMtools on a Windows 2008 Server R2 Core guest running on an ESX 3.5 host? “Hang on,” you say, “R2 is officially supported on ESX 3.5!” And you’d be right, for the moment at least. ESX 3.5 U4 does indeed not support R2 officially yet although VMware support hinted that U5 is due at some point. Still, the customer is king and mine wanted an R2 VM. First things first, the WoW64 Execution Layer needs to be installed and the server rebooted to allow R2 to run 32 bit applications. Once the reboot is complete and you’ve logged in again, select to Install the VM Tools for the VM. Nothing will actually happen except that ESX will mount the VMtools iso on the VM. To install the tools you’ll need to navigate to the drive where the iso has been mounted. In the example below it is the D: drive. Installing the tools is then simply a case of silently executing the installer. This will automatically reboot the server afterwards. Sometimes moving a server into a Virtual Infrastructure is not straightforward. Consider a server that has software on it that is licensed based on a MAC address for instance. MAC addresses start with a vendor ID and the rest of the address is made up with hexadecimal numbers to make each MAC address unique. VMware’s vendor ID is 00:50:56, all VM NICs will have MAC addresses starting with it.